I’m no shooting expert, nor will I ever claim to be one. However after sixty-odd years of dedicated shooting, I do consider myself as being a well-seasoned shooter, and needless to say I’m set in my ways. On occasion, I’ve heard expert shooters (and they truly are experts) refer to shouldering a rifle as forming a proper “weld” with the firearm. Well folks, being a farm boy accustomed to using a welder since my youth, being solidly bonded to something involving molten steel and with sparks flying during the process doesn’t appeal much to me at all. I personally refer to shouldering and cheeking any long gun in a fluid, copasetic (to merge and blend) manner as forming a proper “meld”. I’ve long told folks asking my assistance in selecting a long gun, that if they don’t meld to it right away in a natural fashion, check out another one, because no sort of (firearms) pre- marriage counseling is going to help that particular wedding along a bit. 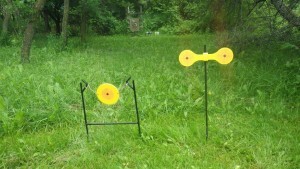 I taught all three of my sons to shoot, my way, and I have yet to hear any complaints. All three have become what I like to refer to as being seasoned shooters too. It was with great delight when I was able to recently watch my son Josh introduce his six year old son Orlando to the world of shooting (by living on the back of the farm and in the middle of the woods, I do have the convenience of having my own shooting range, which does see frequent use and my sons grew up with this atmosphere). The rifle used here for Orlando is a (Made in the USA) Henry “Mini-Bolt” single-shot .22 that is really sized down to properly fit kids, so much so I had to check its sight-in point just like firing a handgun. Not surprisingly, it came from the Henry Arms factory as accurate as can be. I purchased this little rifle some years back with grandchildren in mind and it has been paying dividends ever since. To start kids out, I personally believe in plinking at targets of animated interest. 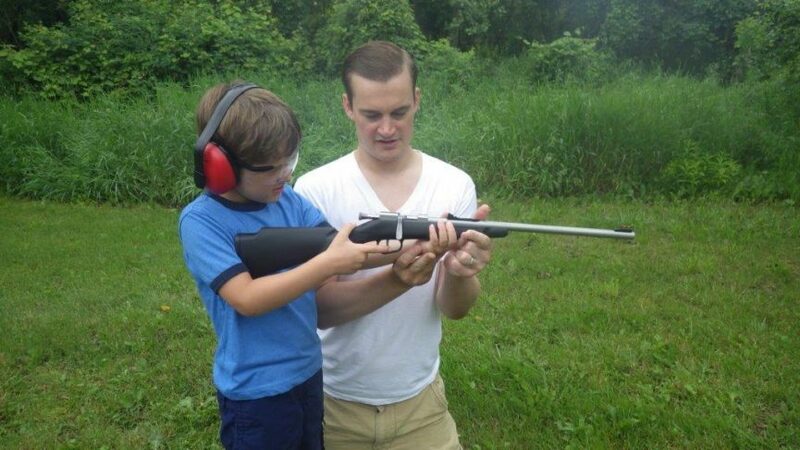 Punching holes into paper targets is fine to begin with in order to see if the rifle is on, but plinking is whole bunch more fun for a kid, and actually relates to actual in the field shooting practice. Tin cans (with a proper backstop of course) do a fine job, as do tethered balloons. Recently however, I’ve been using a couple steel (designed for.22 rimfire) targets from Birchwood Casey called the “Little Rattler” (that twirls when it is hit) and the “Sidewinder” (that spins around when hit). Both continually offer a target without having to go in a set them back up, and there is a notable metallic clang when they are hit. They certainly do the job. Josh went through the “meld to the rifle” process with Orlando and I stayed back, kept quiet, and enjoyed watching it all. This was purely a father and son moment that I had gone through with Josh many years before and I was real pleased to see the torch being properly passed on, so to speak. Pretty soon Orlando was ready to shoot, and he got right into it. Hearing the target clang and move around really made his day. Despite the fact he was only firing .22“CB Shorts” which don’t make much of a report, Orlando was still wearing proper ear and eye protection, which is always very important when shooting firearms. To be quite frank, I thoroughly enjoy plinking at the “Little Rattler” and “Sidewinder” myself with a variety of .22 firearms (including handguns) on a steady basis, especially when late summer is already upon us. In no time at all the mid-September squirrel season will be here, and I need to stay tuned up because it is a timeframe that I thoroughly enjoy each year. It is a pastime that I introduced to my sons, and they are in turn introducing to their children (including both sons and daughters). Squirrel season is actually the prelude to all of the fall hunting seasons for us. This is especially in regards to the annual firearms deer season, and most everything I’ve learned about deer hunting directly relates to my experience in the woods that I obtained while squirrel hunting, and my sons were well adept at squirrel hunting before they ever went deer hunting (the same applies to their children). The start to all of this is plenty of plinking with a .22 rifle, and I’ve found that when you can hit the target on a regular basis with a “twenty-two”, hitting the mark with the bigger guns (including handguns) becomes second nature. And when you can regularly bag squirrels in their woodsy environment, it does wonders for your ability to bag whitetails, which includes involving acute marksmanship under a variety of typical field conditions. Preseason plinking certainly works for me.